The National Association for the Advancement of Colored People (NAACP) is the nation's oldest civil rights organization, founded in 1909 in New York City by black and white activists seeking to influence the progress of social justice in the United States. Its primary focus has been the advocacy of ethnic minorities in their quest to gain equal rights under the law. In 1917 the first three North Carolina branches of the NAACP were established and immediately began waging antilynching, fair employment, voter registration, and equal education campaigns. Over the next 25 years, the number of branches increased sevenfold, and in 1943 a State Conference of NAACP Branches was formed to serve the state's (primarily black) membership of 5,700. Five years later the leadership of the state conference was assumed by Kelly M. Alexander, who had previously revived his native Charlotte's NAACP branch in 1940. During Alexander's 36-year presidency (he relinquished the post only months before his death in early 1985), the North Carolina State Conference of NAACP Branches became the largest in the nation; it eventually included more than 120 branches with a membership of 30,000. In 1955, in the wake of the U.S. Supreme Court's Brown v. Board of Education of Topeka, Kansas decision, Alexander led the NAACP fight to desegregate North Carolina schools. A dominant figure within the national organization as well, he was elected to the NAACP Board of Directors in 1950; he became vice chair in 1976 and chair in 1984. Robert F. Williams was another native North Carolinian recognized by the national NAACP, although he was cast in a less favorable light. Formerly the president of the NAACP branch for his hometown of Monroe, Williams was removed from office and denounced by the organization's leadership in the late 1950s for encouraging "armed self-reliance" among his Ku Klux Klan-terrorized black membership. Williams's defense-he had advocated self-defense, not aggression-inspired a national debate among civil rights groups over violent versus nonviolent tactics; his 1962 book Negroes with Guns had a profound influence on Black Panther Party founder Huey P. Newton. The 1960 Greensboro sit-ins and their imitators, while essentially nonviolent in nature, presented another challenge to the national NAACP's courts-oriented approach to activism, and the organization only hesitantly expressed its support for these student protests. Although its methods may have appeared mild to some civil rights activists, North Carolina's NAACP remained a highly visible and controversial force in state politics throughout the second half of the twentieth century. It was a favorite target of traditionalist groups that opposed the goals of integration and racial equality and conservative politicians who stressed the close ties (both real and imagined) between the NAACP and allegedly communist-driven organized labor. In the post-Cold War era, red-baiting has been largely replaced by accusations of reverse discrimination and excessive political correctness. Racial tension and other animosities between the NAACP and its detractors continue to run deep. Nevertheless, state and local NAACP leaders have amassed an impressive list of civil rights victories on behalf of North Carolina's African American population and remain vigilant against any and all attempts to disfranchise them. As of 2006, there were 101 NAACP branches in the state. Wyllisa R. Bennett, "The Alexanders: NAACP Family Affair," Southeast Perspective Magazine, vol. 2, no. 3 (1996). Raymond Gavins, "The NAACP in North Carolina during the Age of Segregation," in Armstead L. Robinson and Patricia Sullivan, eds., New Directions in Civil Rights Studies (1991). Additional Resources: (accessed November 28, 2012). NAACP of North Carolina website: http://www.naacpnc.org (accessed November 28, 2012). Rev. Dr. William Barber II, president of the NC NAACP website: http://www.revwilliambarber.com/ (accessed November 28, 2012). "Ask Anything: 10 questions with NAACP President Rev. William Barber." WRAL.com. December 16, 2008. http://www.wral.com/news/local/story/4142989/ (accessed November 28, 2012). 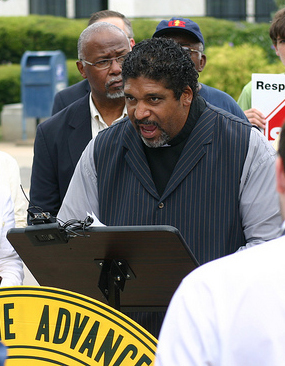 "NC NAACP President Takes a Stand for Amendment One." NAACP. May 06, 2012. https://donate.naacp.org/blog/entry/nc-naacp-president-takes-a-stand-for-amendment-one (accessed November 28, 2012). "Interview with Mabel Williams, August 20, 1999. Interview K-0266." Southern Oral History Program Collection (#4007), The University of North Carolina at Chapel Hill. http://docsouth.unc.edu/sohp/K-0266/K-0266.html (accessed November 28, 2012). "IMG_3176." Raleigh, N.C. June 22, 2012. Image from Flickr user NC Justice Center. http://www.flickr.com/photos/ncjusticecenter/7415868186 (accessed November 28, 2012).